Writing an appealing and interesting Google+ post is not the only thing one might know when posting an URL on the social network. In this post I detail several technical facts that you should keep in mind when posting to increase your SEO and enforce social trust. You will learn which URL can be indexed from a Google+ post and the impact on your social metrics. However, a post on Google+ has external consequences, especially on the number of views, +1, comments and shares your URL will receive. Depending on your inclination, you might believe that these metrics are important or not. I will not argue on that point, and will just give you few takeaways about how to share an URL in different contexts. First things first, I call a (public or private) share an URL that is mentioned on Google Ripples : see our previous articles “What are Google+ Shares and how to retrieve them ?” . Google makes the distinction between private and public shares : in the former case, the URL is shared among a restricted number of people while in the latter, the URL is shared publicly (pretty obvious, isn’t it?). Depending on your strategy you might use one of the previous three cases. If your goal is too share and collect reshares for a URL you might use the first and second example. 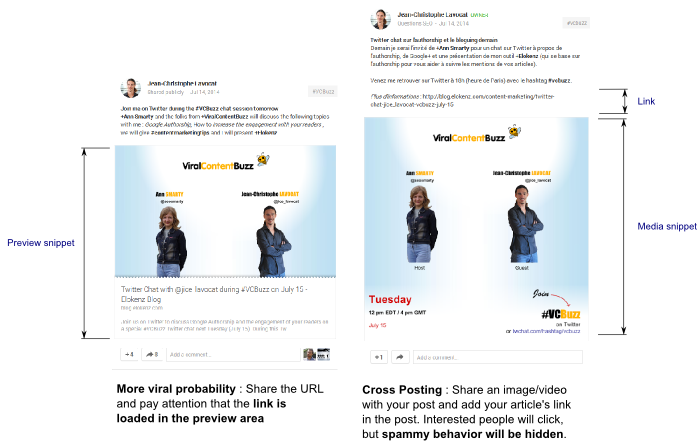 Be aware that if you share several links in the same post (example 2), only the one appearing in the preview snippet will receive shares ans reshares. If you aim at ‘hiding’ a share, then you should use the third example. However, you should realize that you are loosing the potential of virality. In this example, Cyrus Shepard lost 23 shares by posting his link like he did. You might wonder why people would like to “hide” shares. Well, the answer is pretty obvious : sharing too much is a bit spammy. I have a concrete example to give you. When I post an article on G+, I usually post it on my own stream and then on 2 or 3 targeted communities. To avoid being flagged as a spammer, I usually decide beforehand which location will be more subject to reshares (my own stream or a community). I then post my link only in this place, paying attention that the preview summary got activated. Finally, I post my article to other locations with a picture instead of the URL preview. By doing this I am ‘hiding’ the share and I don’t look like a bad spammer. When ‘hiding’ the link in the content of your post, your readers still have the possibility to click it and read your post. Another good reason to hide shares is when you are using the Google+ comment box on your own site. 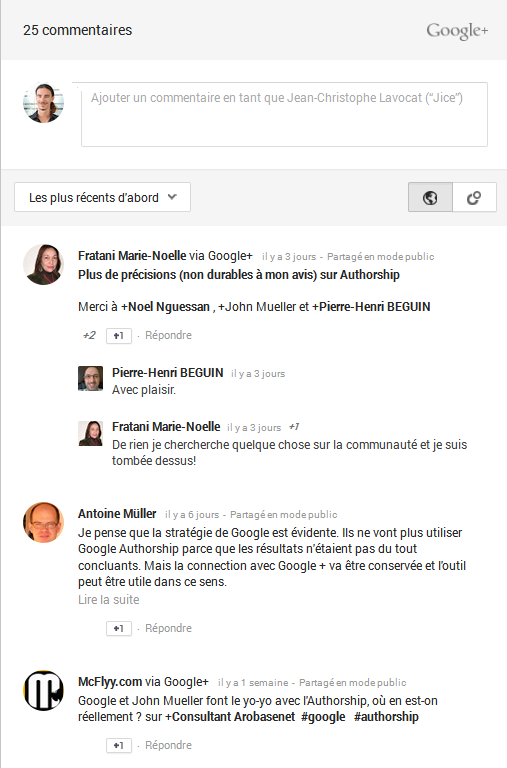 Of course it is not an official widget, but many webmasters are using it in order to increase visibility : whenever someone comments using this box, the comment can be shared directly on the user G+ stream. I am often using it on my blogs to increase the amount of reshares. Therefore, if you want to use this comment box, please, pay attention to the way you are sharing your links on Google+. If you optimize your posts, you might be able to receive more shares while preventing spammy behavior. Alright, so we covered the social aspects of URL sharing on Google+. Let’s now look at the SEO side. This section is based on experiments I ran in April 2014, thus results might have changed. As we just have seen, you can share an URL in a G+ post with a preview or without the preview. Before running my tests I thought that the URLs shared without a preview would not be indexed by Google and that URLs shared with a preview would get indexed. I decided to run a test to verify these assumptions. I also wanted to see what was the difference between a private and a public share for the indexation. Four pages were created with random unique content , a valid layout (title, headings) and an image. Each page was containing a unique word like “apolintruc”. The final outcome is really not what I expected. Eventually, the two public posts had their URLs indexed, while the private ones were not indexed at all, not even the post with the link preview. Therefore, if you want to gain some SEO juice, always post links in a public way ! That might have seemed obvious for some of you, but I have not read it elsewhere before. 173.245.54.83 - - [08/Apr/2014:12:11:06 +0200] "GET /test/atraminouita.html HTTP/1.1" 200 1615 "-" "Mozilla/5.0 (Windows NT 6.1; rv:6.0) Gecko/20110814 Firefox/6.0 Google (+https://developers.google.com/+/web/snippet/)"
The documention sends you to the Snippet documentation and there not much to say about that except that (of course) you won’t receive it if your link was not pre loaded in the preview snippet. 173.245.54.83 - - [08/Apr/2014:12:13:22 +0200] "GET /test/atraminouita.html HTTP/1.1" 200 1615 "-" "Mozilla/5.0 (compatible) Feedfetcher-Google;(+http://www.google.com/feedfetcher.html)"
This is the real guy who will ignite the indexation of your page. I don’t really know what triggers the indexation since the documentation is rather vague about it, but, the fact is that at some point, GoogleBot came on my pages to index them (it took actually so long, that I could not find it in my logs). It’s interesting to note that Feedfetcher did not disappear with Google Reader ! 173.245.56.68 - - [08/Apr/2014:22:45:23 +0200] "GET /test/razominawo.html HTTP/1.1" 200 1799 "http://plus.url.google.com/url?sa=z&n=1396989924414&url=http%3A%2F%2Fwww.graphemeride.com%2Ftest%2Frazominawo.html&usg=DymRAVdehswUyvEh0bzZypqGlOI." "Mozilla/5.0 (Windows NT 6.1; WOW64) AppleWebKit/537.36 (KHTML, like Gecko) Chrome/34.0.1847.116 Safari/537.36"
Here you see the IP of my visitor 173.245.56.68 and the referrer http://plus.url.google.com/url?sa=z&n=1396989924414&url=http%3A%2F%2Fwww.graphemeride.com%2Ftest%2Frazominawo.html&usg=DymRAVdehswUyvEh0bzZypqGlOI. usg : I could not reverse engineer this one, but I would love to see it being the user who clicked. If you want to get more shares, pay attention to the preview snippet and have your link description loaded there. Finally, since every click counts (and Google records that), post an appealing content together with your link. Your followers will anyway prefer that.